University of Oklahoma President David Boren announced Tuesday that the school has expelled two students who allegedly played a “leadership role” in a racist song performed by members of the Sigma Alpha Epsilon fraternity on a charter bus. "I have acted today to expel two students who were leaders in the singing of a racist chant," Boren said a statement. Boren added that the school’s investigation of the chant is ongoing. The video -- first revealed by Unheard, a student civil rights group on campus -- triggered immediate responses from the school, which severed ties with the fraternity, and SAE’s national organization, which said it had shuttered OU’s chapter. "To those who have misused their free speech in such a reprehensible way, I have a message for you. You are disgraceful," Boren said Monday in an email to students, faculty, and staff, according to KGOU. "You have violated all that we stand for. You should not have the privilege of calling yourselves 'Sooners.'" 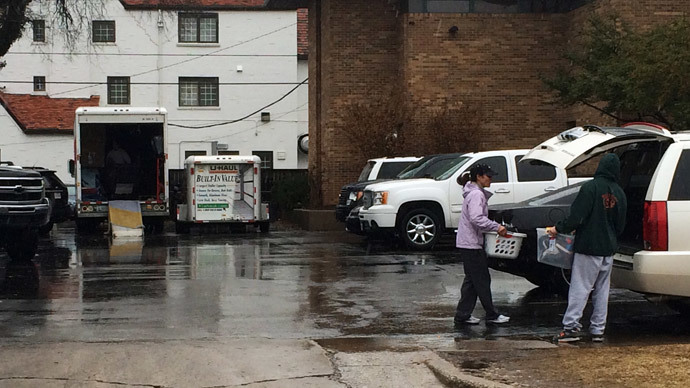 Boren gave SAE members until midnight Tuesday to clear out their belongings from the campus fraternity house. The Oklahoman reported that state Attorney General Scott Pruitt’s civil rights enforcement office is not currently investigating the incident for any possible violations. @kgborland and the women on the bus will take the same career paths. SAE members are not the only ones caught up in the controversy. Members of OU’s Delta Delta Delta sorority chapter were seen in the video taking part in the chant. According to USA Today, the sorority’s national office said "behavior documented in the video is deplorable and is in no way consistent with Tri Delta's ideals and core values." OU’s Delta Delta Delta chapter, though, tweeted Monday that it was not part of the university’s investigation. “We fully support our OU president. We are NOT under investigation. The statement on our website is national protocol." That sentiment drew criticism on Twitter. @OUTriDelta if that is the case, why were your members on the same bus with #SAE clapping along? What will happen to those women? @OU_Unheard@President_Boren what makes this so sad is that there were women on the bus clapping also. what is their excuse? Rather than hold a scheduled spring practice, the vaunted OU football team, including coach Bob Stoops and athletic director Joe Castiglione, marched silently in protest of the video, with the group saying a prayer at midfield. Eric Striker, a leader on OU’s football team, told The Oklahoman of past racist incidents he and fellow black student-athletes have faced involving OU fraternities. A top recruit who had committed to attending the school to play football announced Monday that he has rescinded that commitment based on reasons that did not have to do with the staff or team. Meanwhile, White House press secretary Josh Earnest said moves made by OU and SAE’s national organization following the release of the video were "an appropriate step." On Monday, OU students, led by the group Unheard, rallied on campus to protest the video and what it stood for.